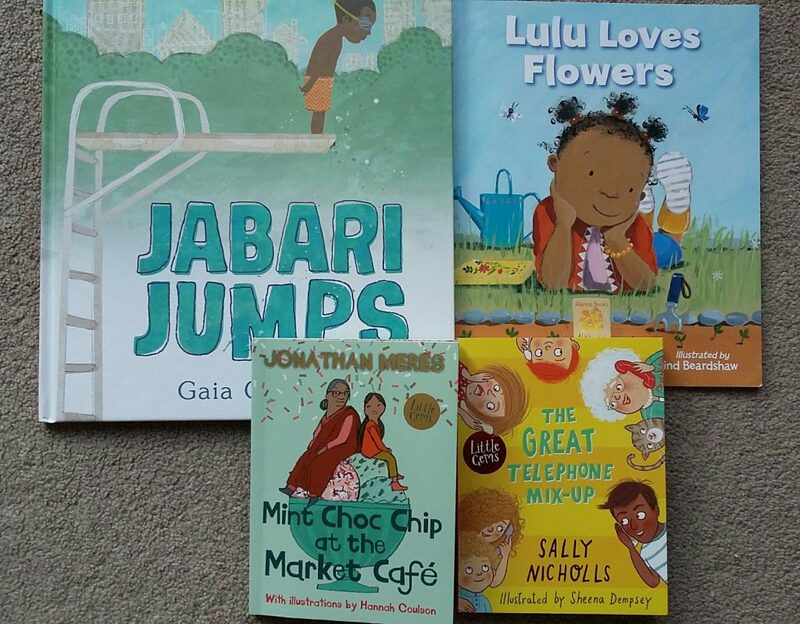 Having taken a particular interest in stories that represent children from all sorts of backgrounds. 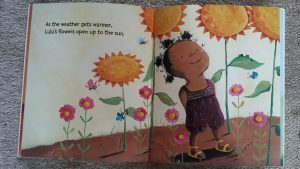 I have noticed that it is only in some of them that the BAME (1) children are doing everyday things, and where their culture or background is not the focus of the story. In this blog post I wanted to highlight some stories that do this particularly well through four mini-reviews. Two of them are picture books and the others are illustrated short chapter books. This story deals with a child’s first experience of doing something in a most delightful way. The story is about being scared to do something new, but then finding the courage to have a go. This is something any child or parent can identify with. 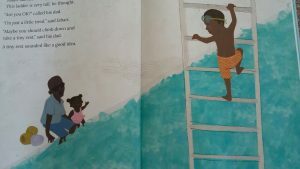 Jabari, with gentle encouragement from his dad (who lets him take his time), finds he has the courage to overcome his fear, and to jump off the high diving board for the first time. 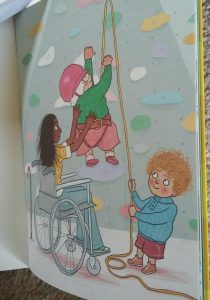 Gia Cornwall has made great use of soft and bright colours in her illustrations, which are really effective in helping to convey the feelings in the moment. 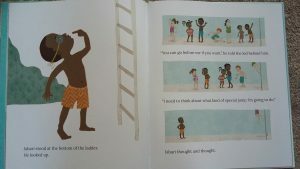 These include scenes by the poolside, and mini-snapshots of Jabri as he takes each small step to the high board. This is sure to inspire children of all ages to have a go. published by Alanna MAX books. This is one of several Lulu stories. It takes you through the steps Lulu, and her mother take to grow some flowers, fruit and vegetables from seed, in a way that even very young children will be able to relate to. Then they share what they have grown at the end with Lulu’s friends. I have found that many young children are fascinated by things that grow. Anna McQuinn has taken a common theme and added her own special twist. 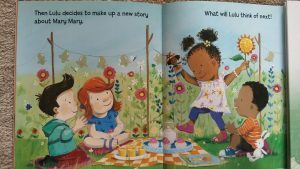 These include: a lovely connection with the nursery rhyme: ‘Mary Mary Quite Contrary’ and; a visit to the library to look up the flowers they want to grow. 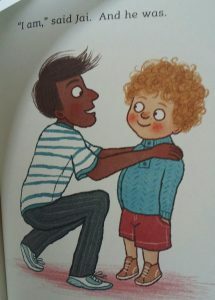 There is plenty for young children to spot in the illustrations and talk about. Hopefully this will inspire more children and their parents to have ago at gardening too. My son read this when he was in year 2. It was one of his favourite Little Gem stories a collection of stories with different authors and illustrators for children aged 6 to 9 years, published by Barrington Stoke. They also have Dyslexia friendly font and pages, but are great for children of all reading abilities. At the start of the story the telephone lines go down in the village. You are then introduced to each character and/or family in the village. The colourful illustrations of Sheena Dempsey really bring the characters to life. It’s clever as the physical features of the characters aren’t actually mentioned in the story so you need to look at the pictures to find out, although the names might give you a bit of clue. 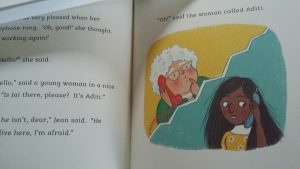 The BAME (1) characters are two adults, called Jai and Aditi, which again is a clever touch. They are not the only ‘reflecting realities’ characters in the book. It’s surprising how rarely you see any children or adults in a picture book wearing glasses. It is great to have a grandma wearing glasses. And some read haired people that are just part of the story, and their hair colour isn’t used to convey a message. The next day the phone lines are reconnected, some brilliant conversations between the characters follow. Soon you realise the phone lines have been mixed up, and different villagers are getting other people’s calls. My son thought this was really funny. What follows is a brilliant piece of storytelling where the reader and the characters are trying to work out who’s message’s they are getting. This leads to them helping each other, and understanding their neighbours a little better. 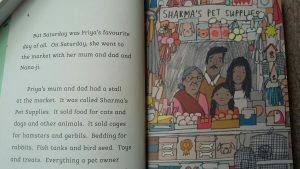 At the start of the story the main character Priya tells the reader three of her favourite weekly things to do: football on Tuesday, science club on Friday and helping at her parent’s pet stall in the local market on Saturday. It is a heart-warming story. Priya learns that unexpected events do not necessarily lead to disaster, and that having an ice-cream with her Nana-ji (Nana) can always make her feel better. 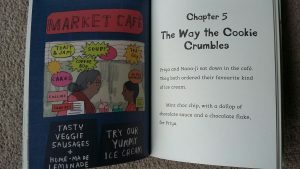 I especially like the bit where the girl and her Nana-ji go to the Café for an ice-cream, which is beautifully brought to life by Hannah Coulson’s illustrations. I also really like that when Priya and Nana-ji are talking in the Cafe you get hints of the girl living in two cultures, but this is just part of the conversation. For example when Priya recalls her mum making Kulfi. You can buy the books from me at Readers that Care, or a good local bookshop. Small independent publisher Alanna Max Books have more great stories with diverse characters.